2 mm of rain fell overnight. It threatened to rain all day but didn’t. The temperature was cool and activity on the wetland seemed to slow with the drop in degrees. Exciting happenings at Peach Flat. Stewart (the builder) and Rod are constructing a picnic shelter and interpretation site. 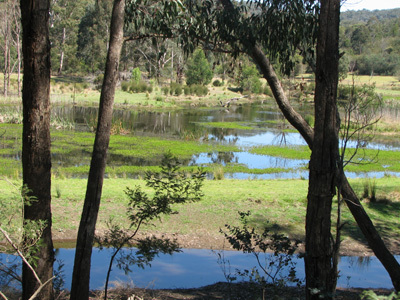 It is located in the carpark on Marathon Rd, adjacent to the wetlands.